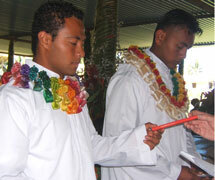 On Dec 29 six Marist novices took religious vows at the Oceania Province novitiate, Tutu, on the island of Taveuni, Fiji. 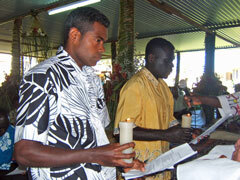 The newly-professed young men come from four Pacific countries. They follow in the footsteps of two hundred and sixty others who have experienced the novitiate formation program at Tutu since 1972 preparing for Marist missionary work in Oceania and other countries around the globe. 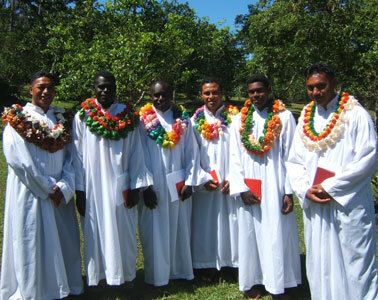 The six newly-professed Marists (from left): Epoki 'Okusitino SM (Tonga), Ambrose Kakatai SM (Bougainville), George Baruka SM (Bougainville), Patrick Semi SM (Tonga), Dennis Levi SM (Solomon Islands) and Kosema Mateasi SM (Futuna). / With Oceania Provincial, Fr Paul Donoghue SM (fourth from right) and Tutu formation staff. Left: The novices pronounce their vows to become Marists, holding lighted candles, a sign of their commitment to Christ. Right: Vested now in albs and leis the new Marists receive the book of Marist Constitutions. 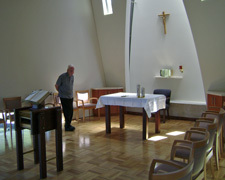 After a short illness Australia's oldest Marist priest, Fr Jim Harcombe, died peacefully at St Anne's Nursing Home, Hunters Hill, NSW, on Dec 17. Fr Jim was the first Australian-born provincial of the province, overseeing a period of vigorous expansion in the 1960's. 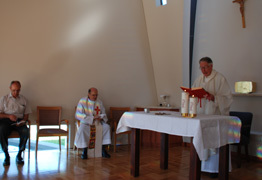 He celebrated seventy years of priesthood on Nov 30. 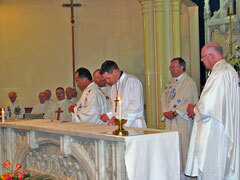 Matthew Crawford SM was ordained to the diaconate in a ceremony in Auckland cathedral, NZ, on Dec 13. 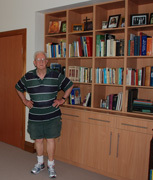 Matthew is a member of the New Zealand Marist province and was a participant in the Marist Mission Centre sponsored 'The Other Half' journey of 2005-06. 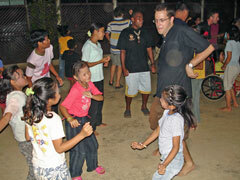 Many Australians know Matthew from his time at novitiate at Ermington, NSW, in 2004. After two years of cross-cultural experience in Mexico and completion of theology studies in Auckland, Matthew will now take up a posting at St Mary of the Angel's, Wellington. Right, above: Matthew with Marist provincial, Fr Brian Cummings SM and Bishop Robin Leamy SM. 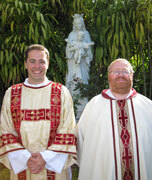 Right, lower: With Australian Fr Tony Kennedy SM, seminary rector for 2009. Above: Scenes from Matthew's final profession ceremony at St Mary of the Angel's church, Wellington, in November. 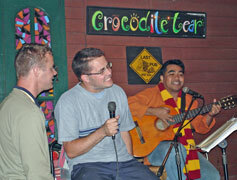 Below: Matthew and members of 'The Other Half', Cambodia and Thailand, 2005-06. 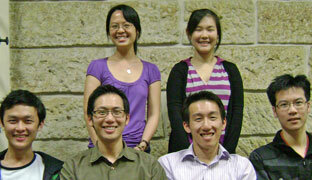 Six members of the Catholic Asian Students Society leave Sydney on Dec 12 to visit the Marist Mission at Ranong, southern Thailand, as part of a three week exposure experience in Thailand and Cambodia. Planning their adventure the group meets at Hunters Hill, front left, back: Linda Mou, Gladys Cheung; front: Lawrence Mou, Clement Cheung, Roland Fan, Calvin Chiu. After their Ranong experience the young people will visit the Marist-supported YODIFEE (Young People with Disabilities Foundation for Education and Employment) in Phnom Penh, Cambodia. As Christmas approaches the Marist Mission Centre, Hunters Hill, celebrates the end of a very successful year. At a function on Dec 08 MMC director, Fr Kevin Stewart SM, thanked the team of staff, volunteers and supporters for such a fruitful year despite the economic downturn internationally. Typical of projects supported by MMC is Guangzhou Huiling, China. Huiling means 'wisdom' and 'soul' and expresses commitment to help persons with mental disabilities to have a thinking mind and a loving heart. Huiling was born as a simple shelter for mentally disabled persons. Now it includes various types of service and accepts people with mental disabilities of any age and social condition. Guangzhou Huiling looks after more than 200 persons with mental disabilities spread in various centers and a dozen family homes. Click here for more on this and other MMC projects. 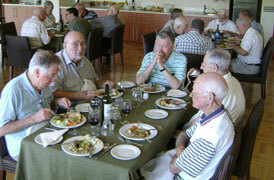 The first meal has been served and the first Eucharist offered in the newly-opened Montbel retirement facility at Hunters Hill, NSW. Two weeks after the opening and blessing ceremony most of Montbel's first residents have moved in. On Sunday Dec 06 they welcomed local and visiting Marists for the first meal to be served in their new home. 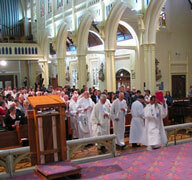 This continues a tradition of nearby Maryvale's 'open house' for Sunday lunch. 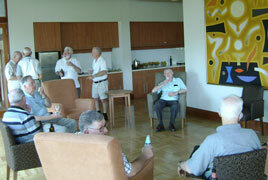 Left: A John Coburn painting dominates the lounge area at Montbel while Marists enjoy pre-dinner refreshments. Below: Scenes of Montbel's striking chapel and first Mass on Nov 07. Happy residents of Montbel are settling in. 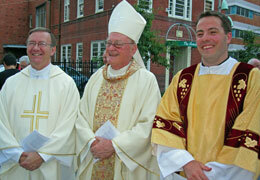 Left: Fr John O'Ryan / Fr John McMillan and Fr John V Walsh. 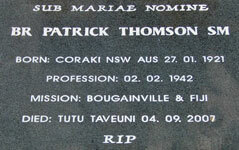 Australian Marist, Br Patrick Thomson SM, laboured for over sixty years in the Pacific before his death on Taveuni, Fiji, in 2007. 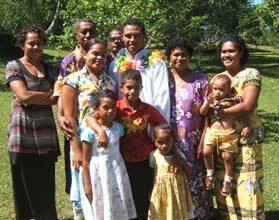 Br Pat pioneered young farmer training in Bougainville before joining the formation community at Tutu. 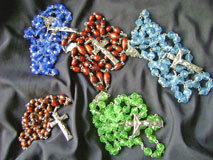 In his latter years he taught the art of rosary making to Marist novices and other confreres. 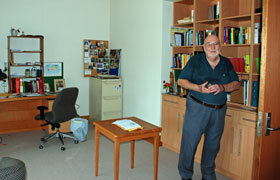 Photos of Br Pat's resting place have recently become available to our web site. 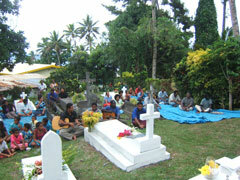 others resting in the cemetery at Tutu, Taveuni, Fiji.